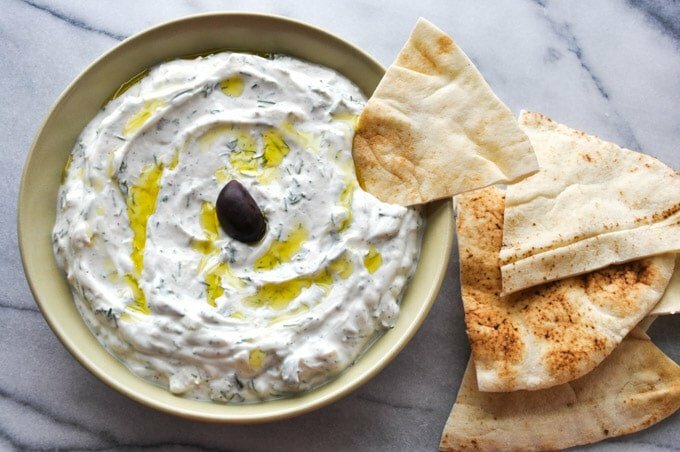 Tzatziki – the creamy, minty, garlicky Greek dip that goes with everything! So easy to make! What can I say about tzatziki? It’s immensely popular and you can buy it at any grocery store. There’s probably a million tzatziki recipes out there. That’s ok though, as I think mine is worth sharing. I’ve tweaked it over the years to arrive at a version I love. It’s wonderfully garlicky and the mint adds a freshness to it. You can do so much with tzatziki. Dip warm pita into it. Have copious amount of it with chicken souvlaki. Make a delicious meal with other Greeks dips such as melitzanosalata. Enjoy it with fried eggplant. I use up the rest of the mint by throwing it in my water bottle during the work week. Mojitos would be more fun, though. 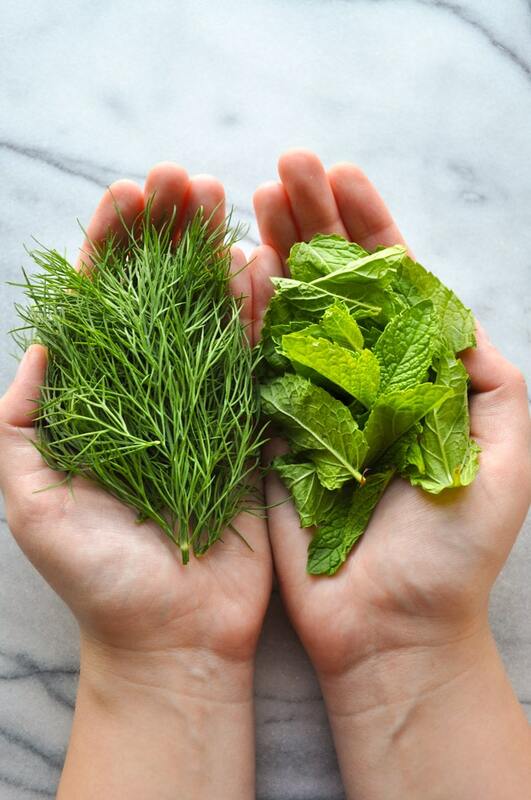 How do you like to make your tzatziki? Talk to me in the comments. 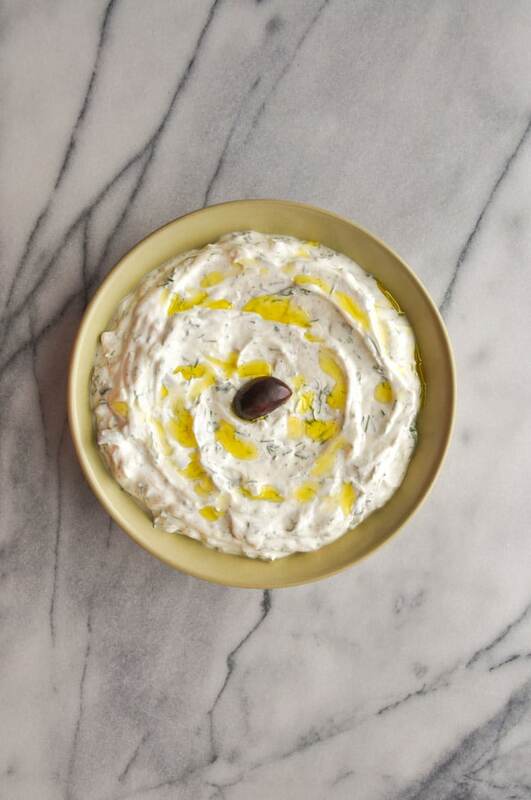 Tzatziki - the creamy, minty, garlicky Greek dip that goes with everything! Put Greek yogurt in a bowl and add garlic, onion, oregano, dill, mint, olive oil, and salt and pepper. Mix thoroughly. You can eat it right away or let it sit for a few hours so the flavors mix and intensify. You can use full-fat Greek yogurt to make this tzatziki extra rich and delicious. I usually make this with 2% Greek yogurt, but I've also made this with plain yogurt instead of Greek yogurt. It's not as thick a consistency but it still tastes delicious. You probably noticed there's no cucumber in this version. I've made it with cucumber and I find with the ingredients I use, you're really not missing anything by not adding it. You can drizzle some more olive oil on it prior to serving. I wouldn't keep this in the fridge for more than a week. Delicious! I’ve never had tzatziki with mint in it before, but I love it. Nice and fresh (and easy to make!). It’s really good – I first had mint in tzatziki at a Greek restaurant then had to replicate it myself!